It doesn’t cost much to jump rope. Dozens of West Virginia schools now have jump rope teams. Some compete with each other. At Cabell County’s Martha Elementary, for instance, more than fifty 3rd through 5th-graders are on a jump rope team that competes in a league with six to eight other schools. In fact, Parkersburg native Tori Boggs, is now the world jump-rope champion! And the Jump Company USA jump rope team at Parkersburg’s Jefferson Elementary competes in world tournaments. The Modern Woodsmen Association gives out free jump ropes free to schools, churches, afterschool programs, recreation departments, scouts and other youth organizations that use their multi-week jump rope and nutrition curriculum. 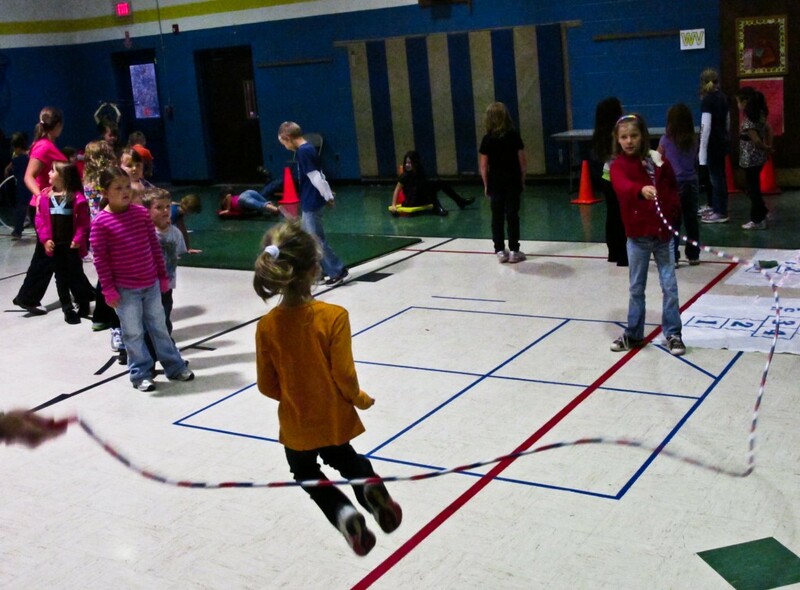 West Virginia set the national record for the most jump ropes sent to schools: more than 4,000 in 2012. A jump rope curriculum and leaders’ manual comes with the ropes. It makes it easy for classroom teachers, P.E. teachers and volunteers to organize rope activities and games. The Modern Woodsmen have a West Virginia office at 1701 5th Ave # 2 , Charleston. (304) 414-4480. Schoenbaum Center. The Amateur Athletic Union of the United States (AAU) offers a great jump rope page that will help you enormously. See video of Lakeside Elementary School Jump Rope Team, Hurricane, WV. Check out the “best jump rope videos from around the world” at Best Jump Rope Videos. And on the list of Best Jump Rope Videos: a video of Parkersburg’s Jump Company USA team. http://www.jumpcompanyusa.com/ Jump Company USA jump rope team has been based at the Jefferson Elementary Center in Parkersburg, WV since it’s establishment in 2006. Made up of boys and girls ages 7 to 24, we are recognized as one of the top rope skipping teams worldwide. Our jumpers compete at Local, Regional, National, and World Tournaments. Jump Company works to promote the sport of Jump Rope by performing at School Assemblies, Professional Events, Civic Organizations and College Venues. Jump Company USA is a member of USA Jump Rope (USAJR) and Athletes for a Better World. Have something to add? Write it in comment below and include your name and contact number, in case we have questions. I am a 25 year professional Elementay PE teacher in Randolph County @ Midland Elementary. I am inquiry if there is a demo team that travels to show case Jump Rope skills to get students motivated for a possible Jump Rope Program? Todd, Jump Company USA travels and can put on programs in your area. If cost is an issue, maybe your school and others in the Randolph-Tucker area can arrange a multi-school jumprope demo. See the Jump Company USA link above. Village of Barboursville Elementary in Barboursville, WV has a jump rope team. If you are interested, I am sure that the PE teacher at the school who coaches would gladly share information. We also have a learning clinic for anyone interested in starting a team or sharing skills in the spring in Milton, WV. Susan, we have a jump rope team coming to the conference, plus a jumprope demo. The coach will be there to consult with. Hope to see you there! Iam a director at a after school program and want to start a jump rope team. Just want to know the basics. Suzanne, look at the resources on the jumprope page. Contact the Modern Woodsmen. They have a step-by-step jump rope team “how-to” manual, and they will give you free jump ropes!